In our continued pursuit of the perfect R&D portfolio, this post discusses the optimal number of projects for an R&D group to execute at any one time. Is there an Optimal Number of Projects for a Portfolio? … Remember that every R&D group has a finite capacity for the number of projects it can handle efficiently at any one time and that capacity is limited by the R&D budget, the size of the group, the collective talent of the R&D group and the state of its organizational infrastructure. Once this capacity has been exceeded, then bottlenecks will occur as projects progress through the new product development (NPD) process. Without project prioritization, important projects will be held up until the bottleneck is resolved. 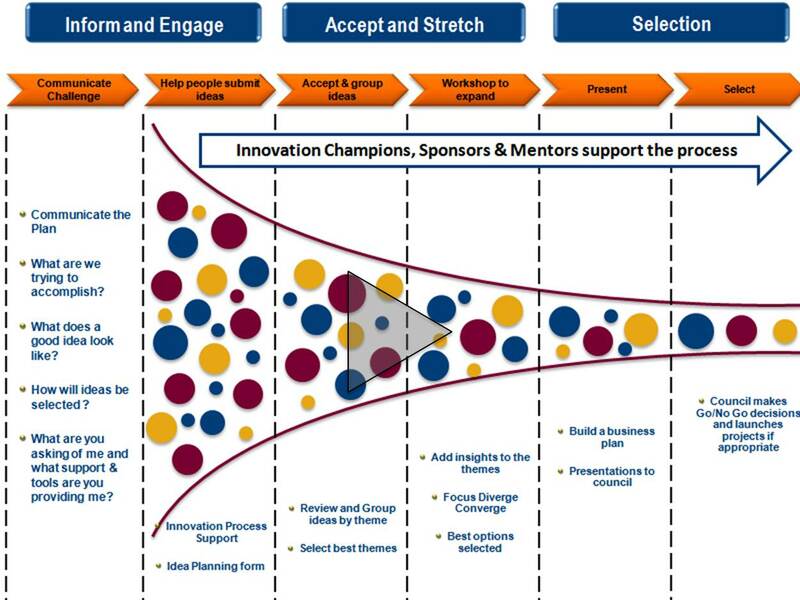 This all suggests that for every R&D group there is an optimal number of projects that keeps the R&D group fully engaged without bottlenecks. However that optimal number varies depending on the average “size” of the projects in the portfolio. The NPD Effectiveness Metric … In the previous post1 we showed how the relative performance of R&D groups from different companies can be compared by plotting the average launch size of new products verses R&D productivity (number of launches per year/R&D budget). Another metric that gives a different view of R&D performance across companies is “new product development (NPD) effectiveness” (average launch size x R&D productivity). I will use that metric going forward to discuss the optimal number of projects in a portfolio. Maximize NPD Effectiveness for the R&D Portfolio … There are two major factors which govern new product development (NPD) effectiveness once the R&D budget has been set: risk and capacity. If you plot the NPD effectiveness of a fully-utilized R&D group having a fixed budget, as the number of projects increases from a small number of large projects through to a large number of small projects you will find that there will be a maximum that occurs somewhere in the middle. This NPD effectiveness maximum is called the “sweet spot”. If a R&D portfolio contains a few large projects then each project by definition carries a relatively large amount of risk. A large complex project can fail for many reasons as there is so much more that can go wrong with complex project relative to a simple project. Also, even if a large complex project is successfully launched it may not reach the desired sales expectations in the market place, which is a further risk. In the situation where the portfolio consists of a few large projects, NPD effectiveness can be reduced greatly if failures occur in even one or two projects. The failures will dramatically decrease the value of the portfolio and hence reduce R&D productivity (and consequently NPD effectiveness). This is the “risk constrained” region of the graph to the left of the “sweet spot”. On the other hand, if there are many small projects, risk is spread over a large number of projects and is reduced because failure of a few projects will not dramatically affect the value of the portfolio. Also there is less that can go wrong for a small project. However if there are too many small projects in the R&D budget, resources become constrained and the pipeline becomes congested, limiting the value of the NPD portfolio and NPD effectiveness. This is the “capacity constrained” region of the graph to the right of the “sweet spot”. 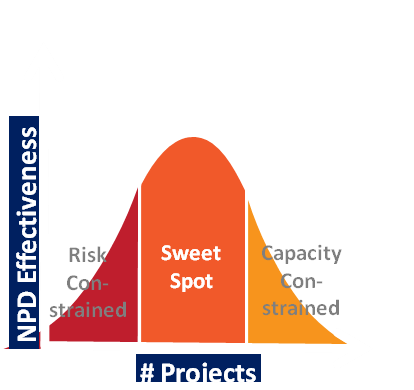 Summary … Looking at the graph, the NPD effectiveness of your R&D group can be optimized by choosing the number of projects that falls within the “sweet spot”. The “sweet spot” is between the “risk constrained” region which contains a few high risk “big idea” projects and the “capacity constrained” region which contains too many projects (often small incremental line extensions or maintenance type projects). “Best in class” companies carefully manage the number of active projects within the portfolio by a strong governance body2 so that R&D resources are fully utilized but not overburdened (i.e. so bottlenecks don’t occur) and the number of high risk projects is balanced by other types of projects. 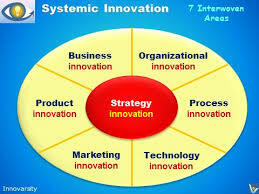 Portfolio optimization is another good example of innovation crescendo at work. Previous post: “Perfecting your R&D Portfolio” discussed the benefits of a balanced R&D portfolio and how to balance risk verses R&D productivity. A future post will examine portfolio governance. What is the perfect R&D portfolio? How many projects should an R&D group have? What types of projects and how many of each kind should be in the portfolio? How should it be managed? These are age-old questions that continue to be as perplexing now as they were in the past and there is probably no “right” answer. It should be remembered however, that every R&D group has a finite capacity for the number of projects it can handle at any one time and that capacity is limited by the R&D budget, the size of the group, the collective talent of the R&D group and the state of its organizational infrastructure. Many companies do not take a holistic look at their R&D portfolio and manage it from a tactical perspective rather than from a strategic perspective. A common example of what I mean by this occurs when projects are added to the R&D portfolio by brand managers to improve their product offerings in specific brands for specific brand marketing reasons. Thus the typical portfolio, in this situation, can be dominated by projects that only address brand issues and consequently projects which might open up new market segments tend to be ignored. Another example of a tactical portfolio occurs when a company aggressively pursues a globalization strategy and the portfolio is dominated by global-expansion projects with the result that “big idea” projects based on innovation can suffer. Distribution of Project Types in the Portfolio … First, let’s look at what types of projects are in an R&D portfolio. These can include “big idea” projects, line extension projects, product improvement projects, maintenance projects and global-expansion projects. 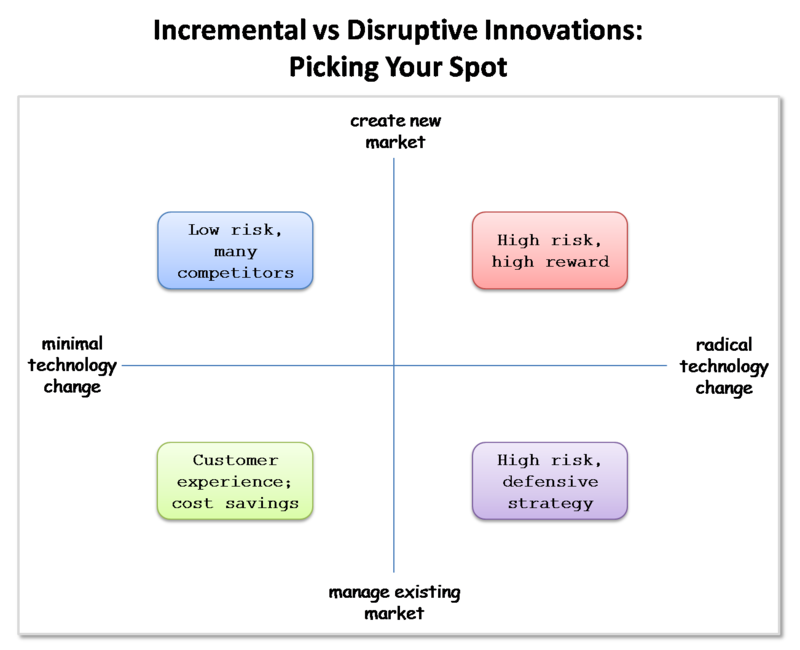 “Big idea” projects are large, risky projects sometimes utilizing a new technology or utilizing a different set of known technologies to enter a new market segment and address unmet consumer needs. Line extension projects are new product offerings within an already established brand. These projects can range from risky, completely new line extensions to rather mundane ones. 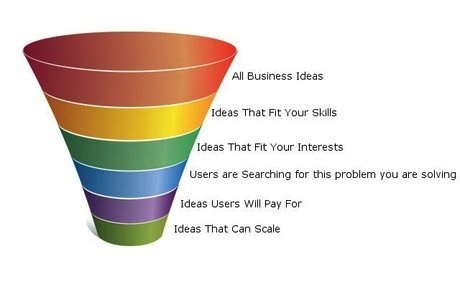 Product improvement projects are basically that….i.e. 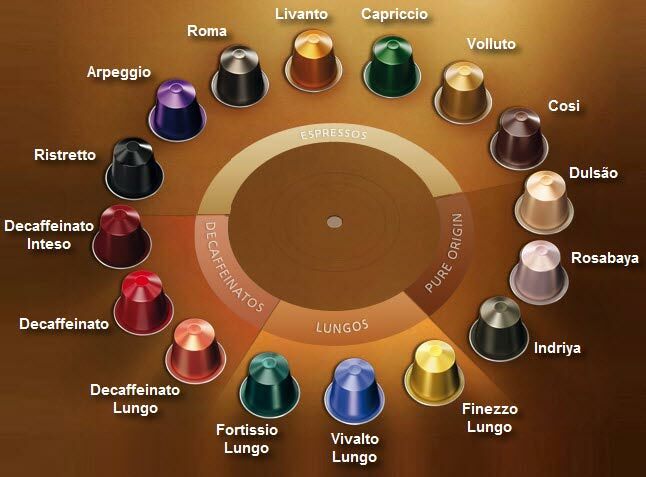 improving the performance, taste, cost or functionality of a product. Maintenance projects are required to keep an already existing product on the market and would be transparent to the consumer….i.e. a change in ingredient because of a regulatory issue. 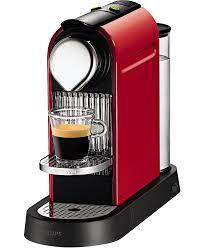 Finally, global-expansion projects are the re-launches of an existing product in other countries. So what is the optimal mix of project types in the portfolio? That depends on the company and industry in which it competes, but if the portfolio is dominated with projects of only one type….it is not an optimal portfolio and signals problems with the R&D pipeline. On average, high performing global companies spend approximately 50% of their budget on “big idea” projects and line extension projects, 25% on product improvement and maintenance projects, and 25% on geographical expansion projects. Although portfolio percentages for each type of project vary widely, “best in class” companies tend to have balanced, diversified portfolios with no one project type dominating their portfolio, unless there is a particular strategic goal which necessitates a lop-sided portfolio. The “balanced” approach ensures a pipeline adjusted for risk and growth at all times. Launch Size and Portfolio Productivity … How is the productivity of R&D measured? When the average annual launch size (i.e. 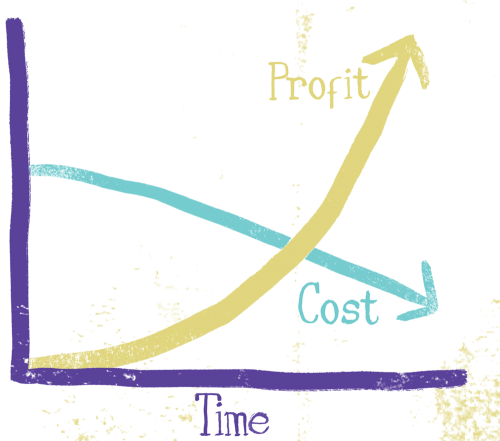 sales of new products/# of projects) of projects is plotted against R&D productivity (i.e. # of launches per year/R&D budget), the relative performance of comp anies can be plotted. Some companies excel at big launches but have a small number of launches (i.e. low R&D productivity), whereas other companies have high R&D productivity but many small launches. Other companies are just underperformers, in a state of innovation collapse, with small average launch sizes and low R&D productivity. Another way of looking at portfolio management and productivity is to consider the impact of projects by “risk” levels. In the graph, companies in the upper left hand quadrant (blue) have a few large launches, but low R&D productivity because risky projects fell by the wayside. 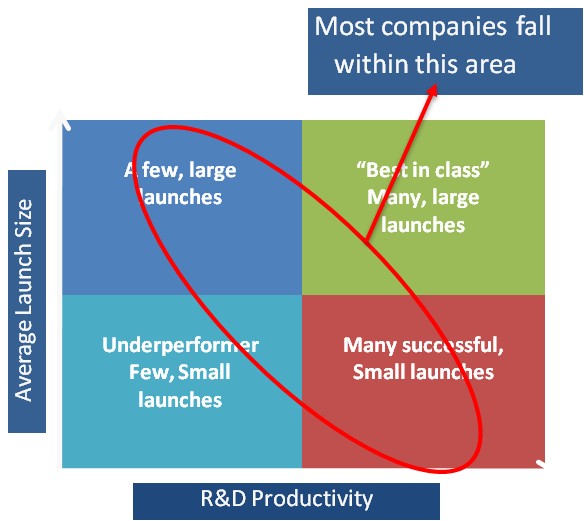 In the bottom right hand quadrant, many low risk projects resulted in better R&D productivity but a small average launch size. Few companies are successful in having both high R&D productivity and high average launch size, although some might say that Apple over the last 5-6 years (2007 – 2012) falls in this class. In practice, many “best in class” companies tend to fall in the middle of the four quadrants i.e. relatively good productivity with relatively high average launch size. A Real World Example of Portfolio Rationalization – Unilever … What’s happened at Unilever is a good example of how a strategy of R&D portfolio rationalization can improve R&D productivity and launch size1. For example, in 2011, Unilever achieved a 17% increase in sales in Indonesia; then its fourth quarter sales in 2012 increased globally by 7.8%2; and now approximately 55% of its sales come from emerging markets. Unilever’s sales are currently growing at more than double the rate of P&G’s. How did they do this? It all happened after Paul Polman became CEO of Unilever in 2009. Among other initiatives, Polman pushed a strategy of focusing innovation and marketing resources on fewer, larger projects with global appeal. 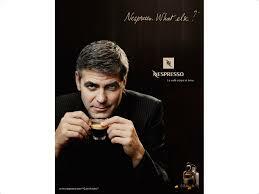 In 2005, Unilever had 5,000 new product projects but only 8 of them were launched in 10 countries or more. 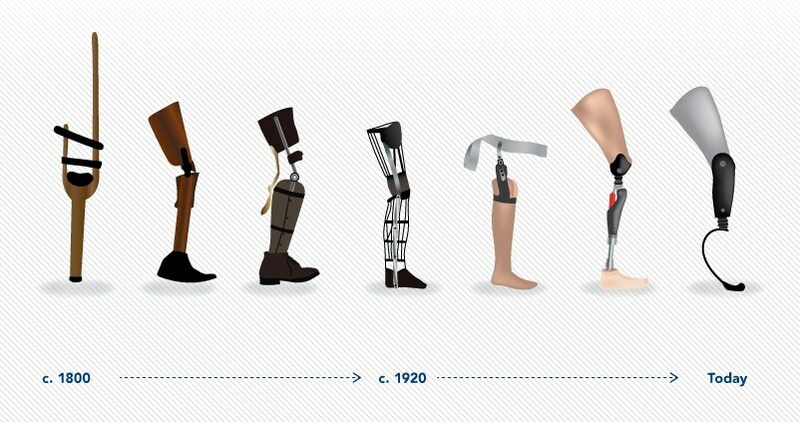 By 2011 it had cut the new product pipeline down to 600 projects and 90 of those were rolled out globally within a year. 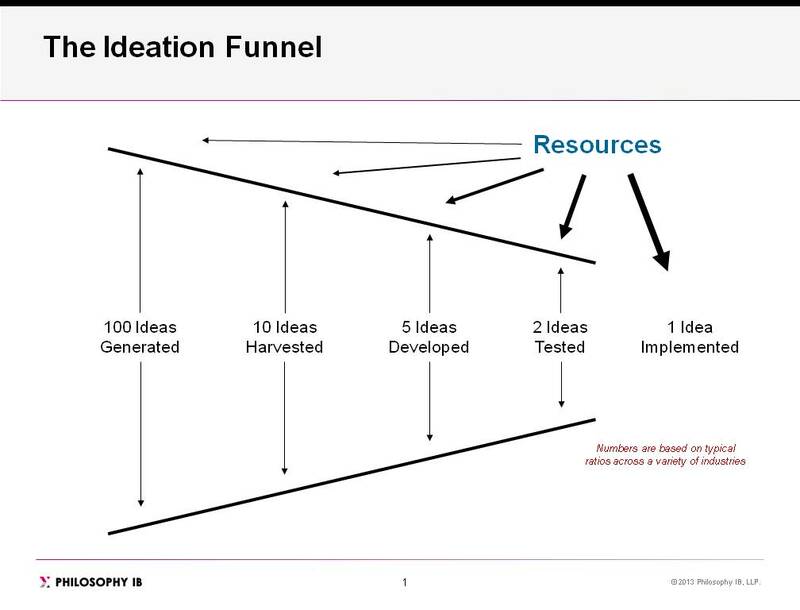 This is a great example of the success of the “fewer, bigger ideas” strategy to portfolio management. Postscript… It is always a good idea to look at the R&D portfolio with a critical eye, much in the same way you would look at your own investment portfolio. Investing in just “big idea” projects is much like investing only in growth stocks. The reward can be high, but the risk is also high. Most financial consultants suggest a balanced diversified portfolio that includes equities, bonds, annuities, cash and other investment instruments to balance risk depending on whether the stock market or the economy in general goes up or down. Similarly, the R&D portfolio should be balanced for the very same reasons. An R&D portfolio with one type of project dominating the others is a red flag and should be addressed. The Unilever example above shows how a portfolio dominated by small line extension and global-expansion projects was re-balanced to include many more global “big idea” projects with dramatic improvements in performance. Truly an example of innovation crescendo.